Men usually don’t have a problem when they feel the urge to take a bathroom break during camping. A quick dash behind a bush will get the job done. However, for ladies and kids, it can turn out to be a bad experience. A good portable toilet will change how you spend your weekends camping with your spouse, friends or family. Here are some of the best portable toilets that you will find on the market. 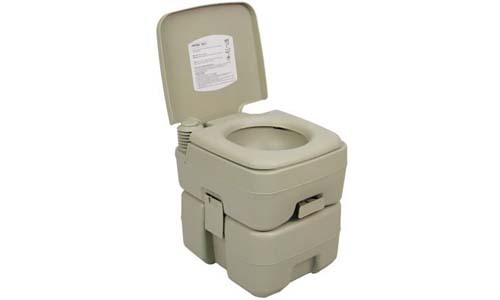 Camco’s amazing 5.3-gallon camping toilet is an ideal solution for anyone that loves camping or RVing. It is also ideal for long car rides. It features a sturdy polyurethane construction that gives it a compact and lightweight design. When empty, it weighs 11.5lbs but supports a load of up to 330 lbs. Each product comes equipped with TST Orange Drop-IN samples. The top flash tank holds 2.5 gallons of water and has a toilet with a lid, set and a bowl. In case water runs out, there is a cap on the top part that can be removed to fill the tank with fresh water. 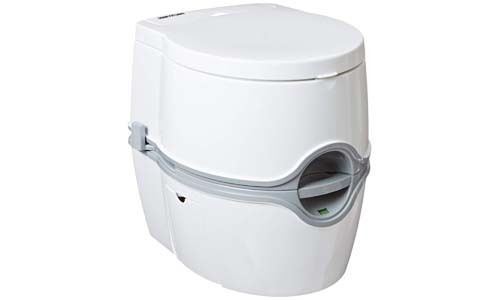 The side has a bellows-type pump that is responsible for flushing water into the tank to remove waste while the side latches secure the toilet to the waste tank. On the bottom half, you get a waste tank with a sliding gate valve that opens for waste and closes securely to give an odor and water-tight seal. The holding capacity is 5.3 gallons. A cap on the back side allows for easy emptying. 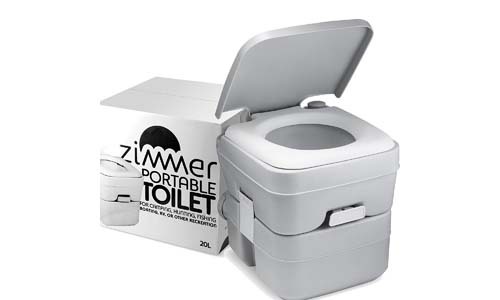 With this portable and lightweight toilet, your camping experience will greatly be improved. It measures 14.7 inches in length by 14.7 inches in width and has a height of 14 inches. These measurements make it a compact product that will easily fit into your RV and will not feel heavy when carried to your camping site. Its seat has a contoured design for added comfort. There are an inner splash cover and toilet paper holder. The inner bucket is removable for waste disposal. You can never go wrong with this product among your camping gear. 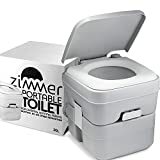 The Zimmer portable camping toilet is a sturdy camping toilet that features a full sized set and lid for extra comfort both for adults and kids alike. 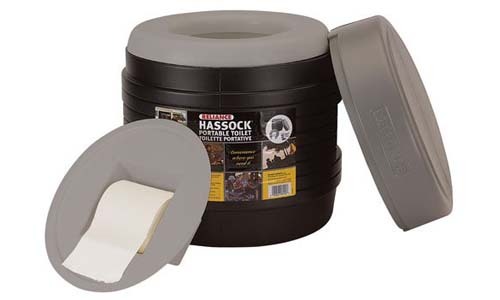 It is the perfect replacement for your house toilet when you are in the outdoors. 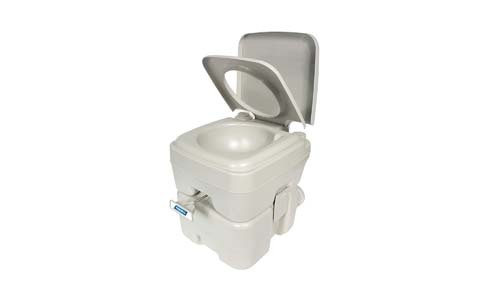 This wonderful outdoor portable toilet has 3-gallon fresh water holding tank for holding clean water for flushing waste. 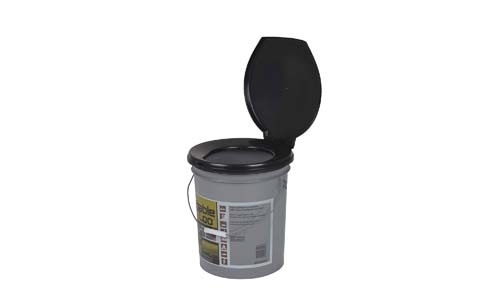 A 5-gallon waste tank makes the product ideal for catering for multiple flushes. Both tanks have side latches for easy disconnection. The tanks are easily removable when you want to refill water or when emptying the waste. 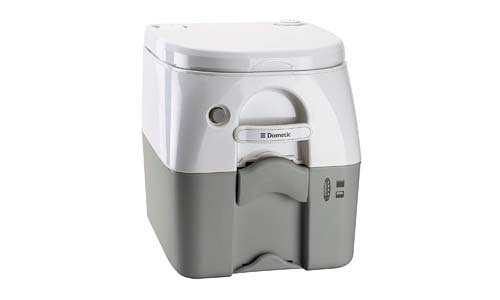 Gray Dometic portable toilet has a sturdy build thanks to the high strength polyurethane material used. The material is responsible for the toughness and strength of the toilet. Its scratch resistant, attractive matte finish makes it ideal for any setting. An adult seat and lid give extra comfort while the side latches hold firmly for added safety. It has a 5-gallon holding tank with a tank level indicator for monitoring how full the tank is. A push button flush clears the bowl quickly to prevent any mess. The Porta Potti Portable Toilet is an award-winning high-quality portable toilet made for RVs, boats, vans, camping, and healthcare. You can also use it for off the grid lifestyle. It has a 4-gallon freshwater tank while the waste capacity has a 5.5-gallon capacity. This toilet has a sleek and modern design and features a comfortable seat height with increased bowl size and a battery powered flush. Using it is easy and thanks to its ergonomic handle, you can carry it effortlessly. There is toilet paper holder and a tank level indicator for monitoring how full the waste tank is before emptying. A closed valve on the structure prevents odors from escaping while the rotating pour-out spout is perfect for emptying the waste tank. 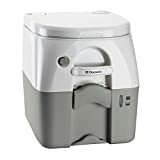 The foldable camping toilet from Reliance Products has a compact, sturdy and lightweight design perfect for field and emergency use. An integrated handle makes it easy to carry. Its innovative leg locking system makes this one of the sturdiest camping toilets that you will find on the market. The entire construction is lightweight and easy to use, it folds easily in a plastic carrying case for easy storage. 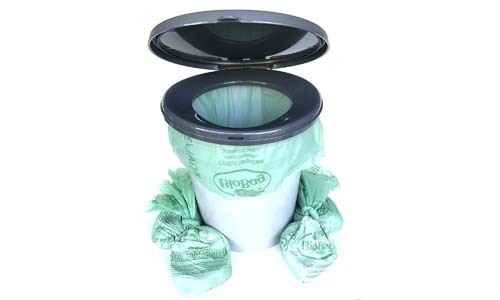 The system is designed to be compatible with the double doodie waste bag system. As soon as you set your eyes on this product, you will realize that it stands out from the rest. It has no holding water tanks nor waste tank. The kit comes with four portable toilet bags that have a liquid and odor absorbent organic media. This toilet will be an environmentally friendly alternative in case of emergencies. The bags make it ideal for outdoor people like construction workers, commuters and campers. It can also be the perfect alternative for homes with sewer or plumbing issues. 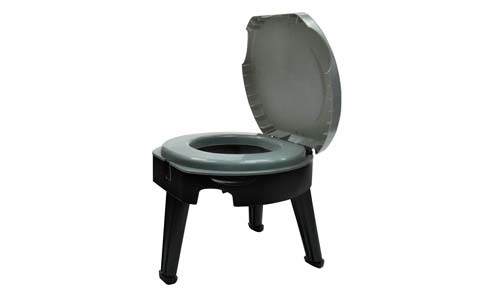 Reliance Products Luggable Loo is a perfect solution for camping and hunting expeditions. It features a standard bucket style design with a traditional strap-on hinged seat and cover. The seat and cover are also sold separately. The product fits most of the industrial pails. This wonderful product is rugged enough to make it ideal for any outdoor adventure. It is compatible with the standard double doodie bag from reliance products for easy mess-free waste disposal. 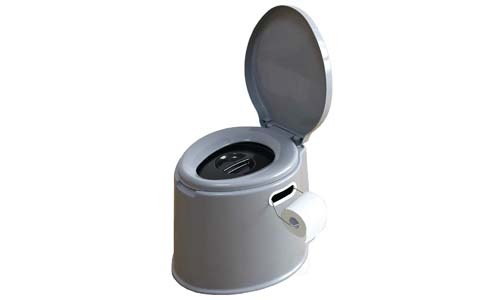 This self-contained portable toilet has a 3-gallon fresh water tank and a 5-gallon water holding tank. It is made from a high-density polyurethane material that gives it its sturdy construction. Its leak-proof design features a double sealed drain valve that keeps odors inside. Heavy-duty side latches lock the tanks together. There is a full-sized seat with lid perfect for any human size. This toilet works just like a residential one and has a matte finish to conceal scratches. A built-in handle allows for portability. The market has a few distinct types of portable toilets. Making your life comfortable is an advantage that cuts across all of them with odor being the only downside. Standard features in most of them include lid covers and deodorizing capabilities. The simplistic form of this type of amenities is a bucket with a disposable garbage bag with a more elaborate design being a whole bowl with legs and lid covers. May use a powder component to turn liquid waste to solid and allow for waste disposal. Many of these products have a lid, seat, and a flush function. They are meant to hold waste for more extended periods because they have hold tanks. These are environmentally toilets that are the perfect replacement for the portable toilets. Waste is decomposed through an aerobic reaction making them the only dry portable toilets on the market. The only downside is that they require a power source to facilitate the reaction. What are the features of a portable toilet? This typically refers to how quickly it can be set up, emptied and packed up for transport or storage. Most of the products on the market have a lightweight construction for easy carrying. When using a flushable toilet, you need to find a place to empty the waste. Some come with biodegradable bags that allow for waste disposal in a designated area or a wooded area. In case you don’t have bags, you can look for a dump facility near your camping location. The volume of the toilet. Some of these products are designed for short-term use while others can be used for a whole week. For longer overnight camping trips you will need to get a bigger one while a smaller can handle one to two days of waste. I believe that you now have a better understanding of what to look for in a portable toilet. The above ones are made from companies with good customer reviews: An indication that they are of a quality build. If I were to pick one, I would go for the Camco Standard Portable Travel Toilet. The fact that it can hold a load of up to 330lbs means I can spend longer days camping before emptying it. 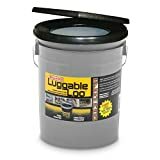 Other features that make it the go-to product include its lightweight design for easy portability, a side bellows-type pump for flashing out waste, side latches for a secure lock and a tight seal for keeping in odor. The Playberg Travel Toilet will be the perfect alternative for anyone with a tight budget.